Welcome to the embarrassingly-belated Part II of "Send Your Kids Back To School With Small Toys In Their Lunch Boxes Which Were Extremely Time-Consuming But Also Wonderfully Cathartic To Make"! Did you miss Part I? It wasn't as much of a mouthful, I promise. 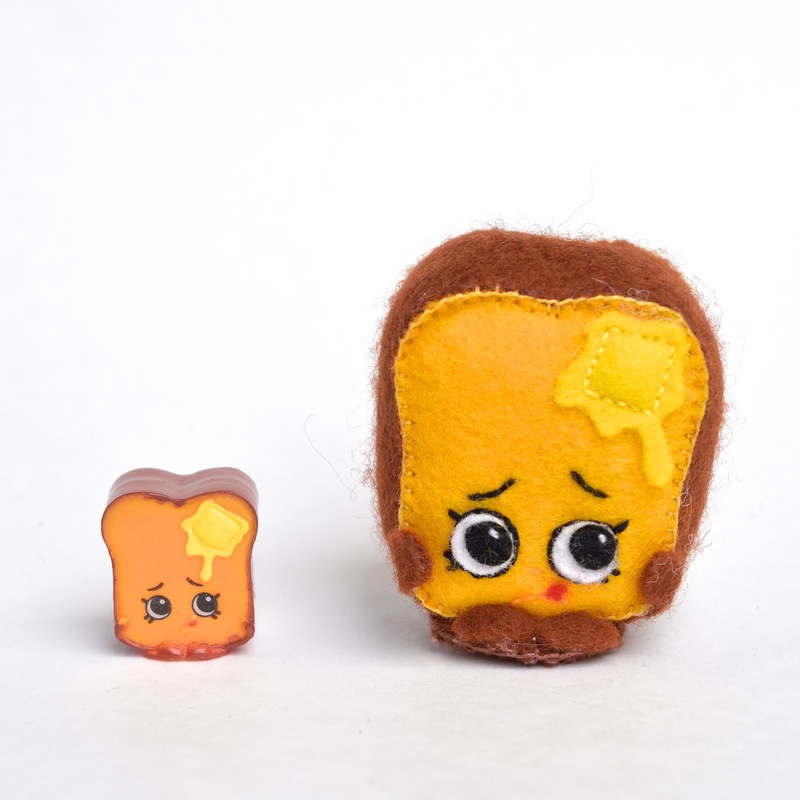 So now that we're all caught up on the oldest child and her felt bugs, let's talk about my other two kids. Every year since I don't remember when, Jenna has had cupcakes in her lunchbox on the Mondays in September. It was always cupcakes, because Jenna loves cupcakes and does not mind getting lots and lots of them. 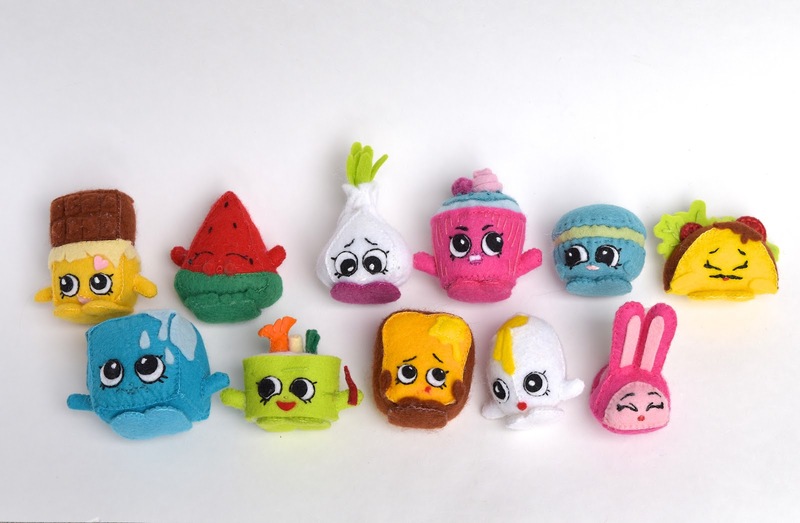 Kate, on the other hand, changes her mind every few seconds about what she likes or dislikes, so each year she gets a different theme of lunchbox toys to accommodate her somewhat volatile attention span. 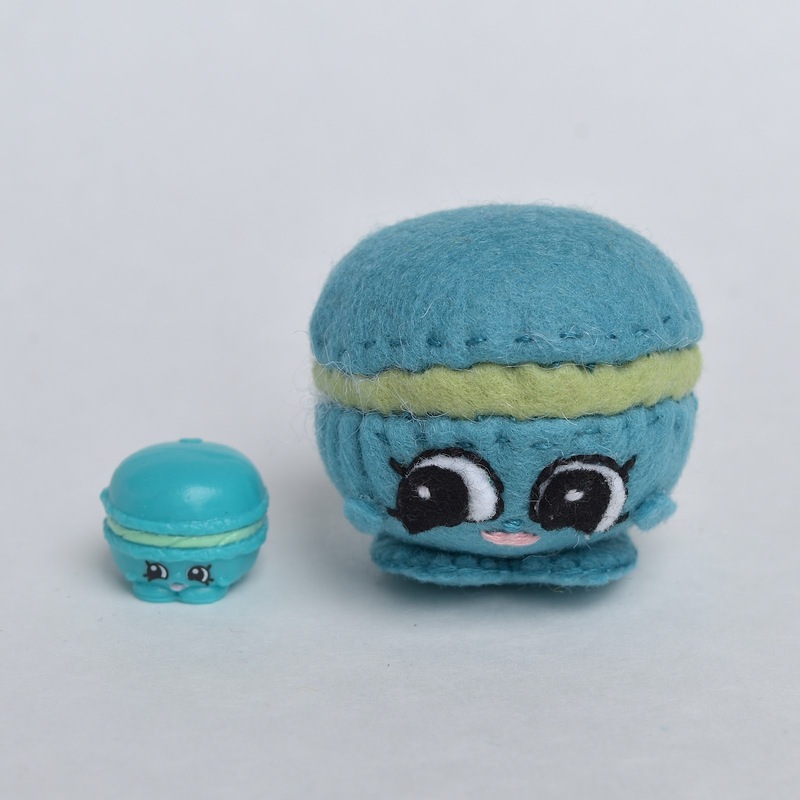 This year, both got Shopkins. 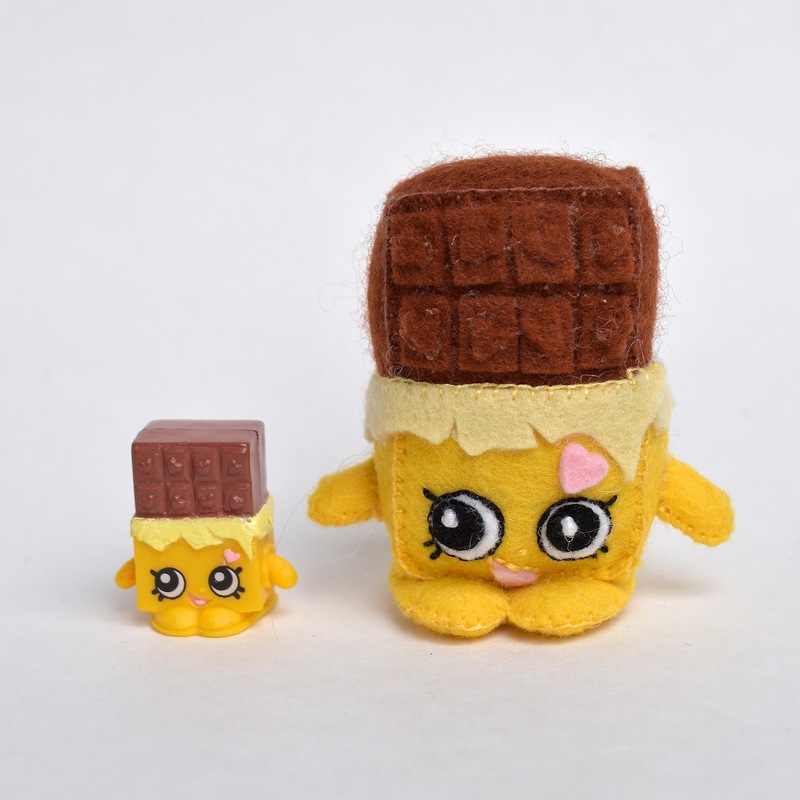 I was in the girls' bedroom and saw their collection of Shopkins and decided, randomly, "I'll make Shopkins, then." and copied them in felt. Ridiculous cuteness and colorfulness aside, it was also an exercise in design. They're not as straightforward as they look, these little creatures. For one, not all of them are easy geometric shapes - a couple of them are cubes and rectangular prisms and general 3-D planes with gussets, but others are more. . . unusual. For another, they're made of felt, meaning that rounded contours ran the danger of puckering and gathering instead of being smooth the way, say, fleece or knit might be. Finally, they still had to look like the original plastic pencil-topper toy, which was tiny. I do love challenges, though. It forced me to think in different ways to achieve certain shapes. Which is always valuable in a continuing-education kind of way when you design toys and stuff like that as your sort-of job. So, if you ever want to improve your design and visualization skills, I highly recommend trying this out - pick a toy and try to render it in fabric, exactly. It will completely open your mind (and fry your patience). After 11, I kinda got bored and stopped. 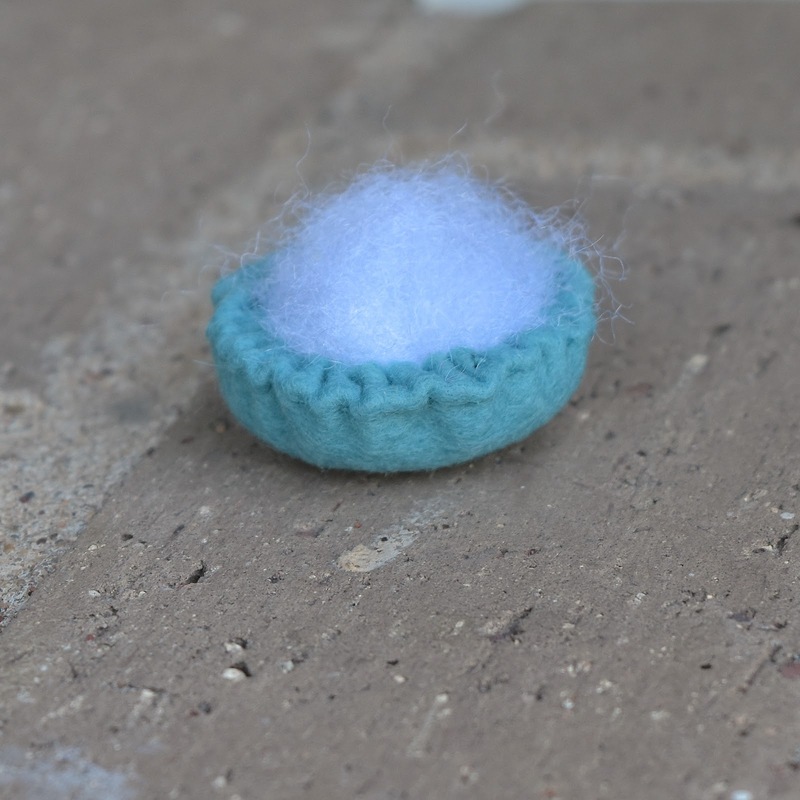 However, I thought I'd share one of the techniques I'd learned from my experiments - shaping a stiff piece of flat felt into a smooth curved surface like a bowl. First, gather the edge of a flat circle as you would if you were making a ball. 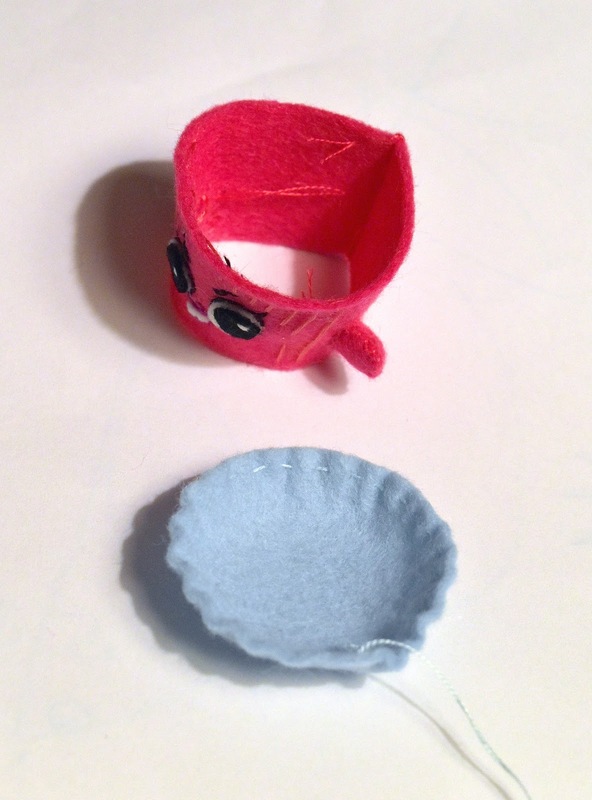 Tighten the thread to the desired diameter of the bowl. Then turn the edge (my SA was about 1/4") inwards to the WS and concentrate the gathers within that 1/4" rim as shown, using your fingers to smooth out the area above that turned-in rim so there are minimal (or no) gathers there. If you have a rigid form (e.g. 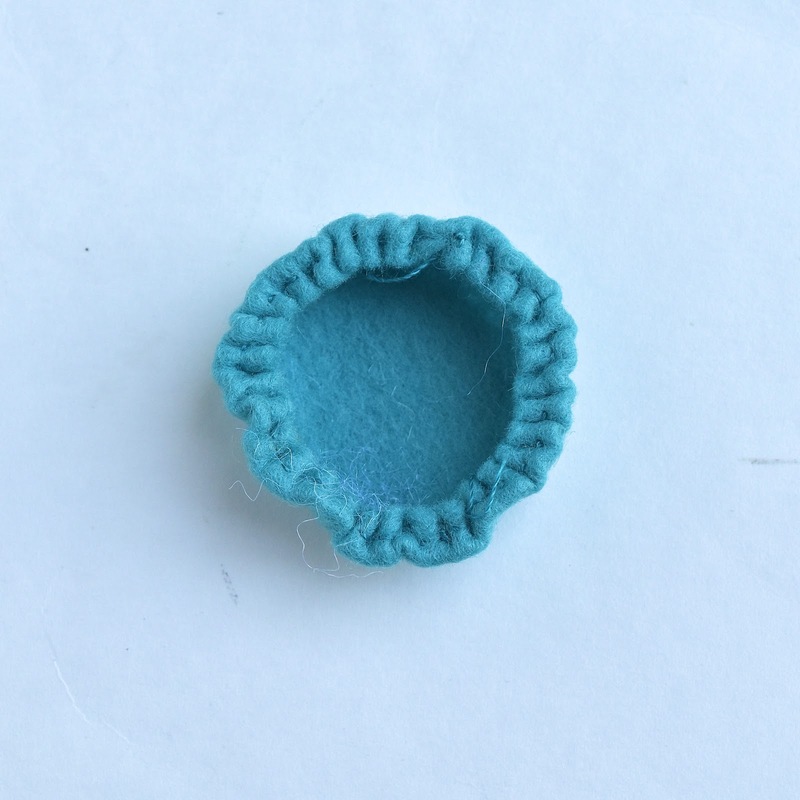 a small bowl that's the exact size) it will be as simple as draping the felt circle over its smooth surface, turning the surplus fabric over the rim and gathering it tightly so the gathers are all hidden within that rim overhang. But you'd not be able to get the form out after, which is why we're doing it this way. easing the gathers smooth as you go. Eventually, you will have a relatively-smooth bowl like this. gives a pretty smooth outcome. 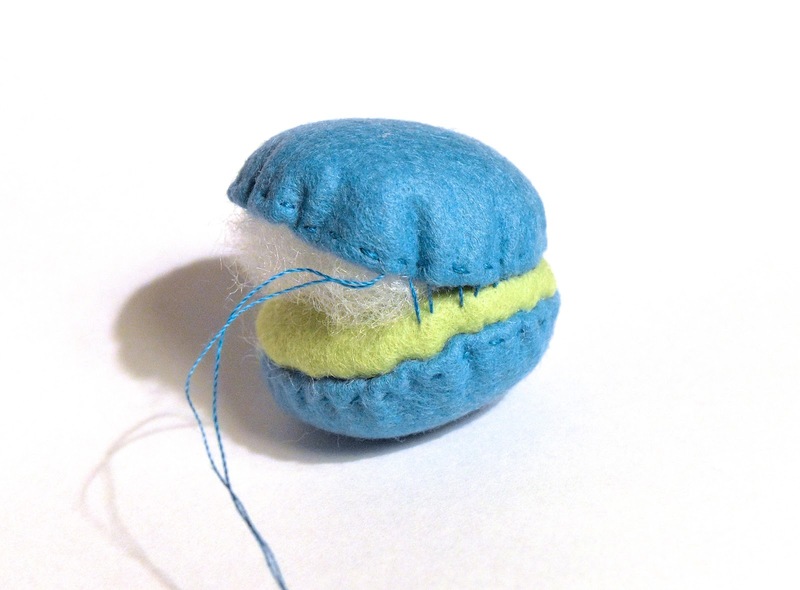 to make a complete macaron (or - if you changed the colors - a hamburger). Here is a random shot to show the foot - a simple flat, double-layered shape stitched to the bottom of the creature to provide stability. leaving the top smooth and rounded after stuffing. And now for some felt talk! 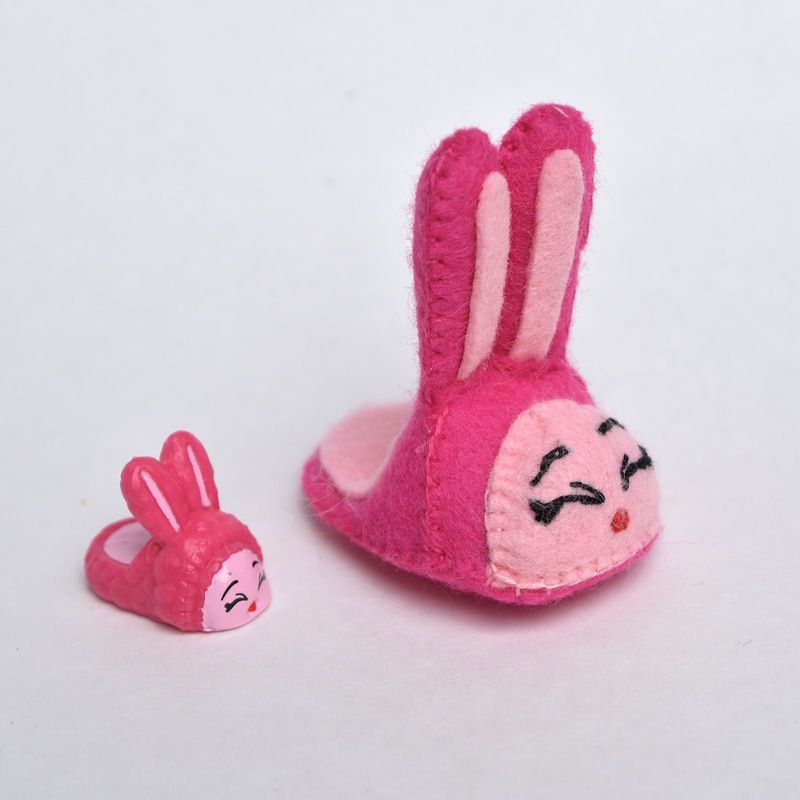 As with Emily's insect collection, the felt for these Shopkins came from Felt on the Fly, courtesy of its proprietor Janet Wieczorek. 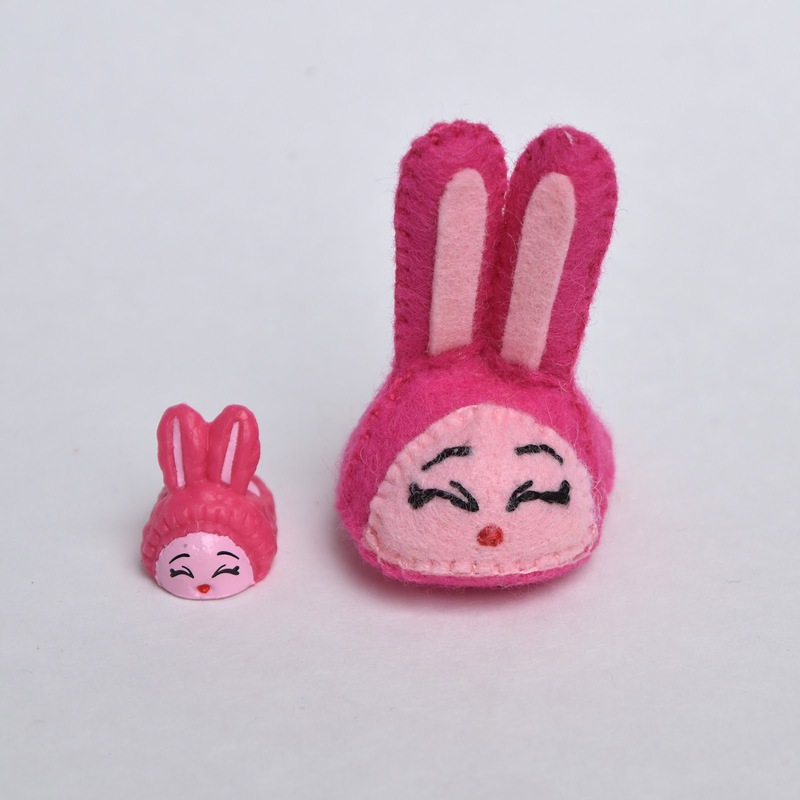 You can read my review of her felt and customer service in that earlier post here, and about Janet and how here business with felt began here. While corresponding with Janet, we talked about the different kinds of felt available on the market and how it can potentially be confusing for people to know which kind to buy for different projects. Here is a quick summary of our research, explaining the common kinds of felt you can find in stores and what to pay attention to so you know what you're looking at and paying for. Thank you, Janet, for sharing your years of experience and expertise with us! Let's start with what felt is: a non-woven, non-directional fabric. It doesn't fray and doesn't stretch (usually). 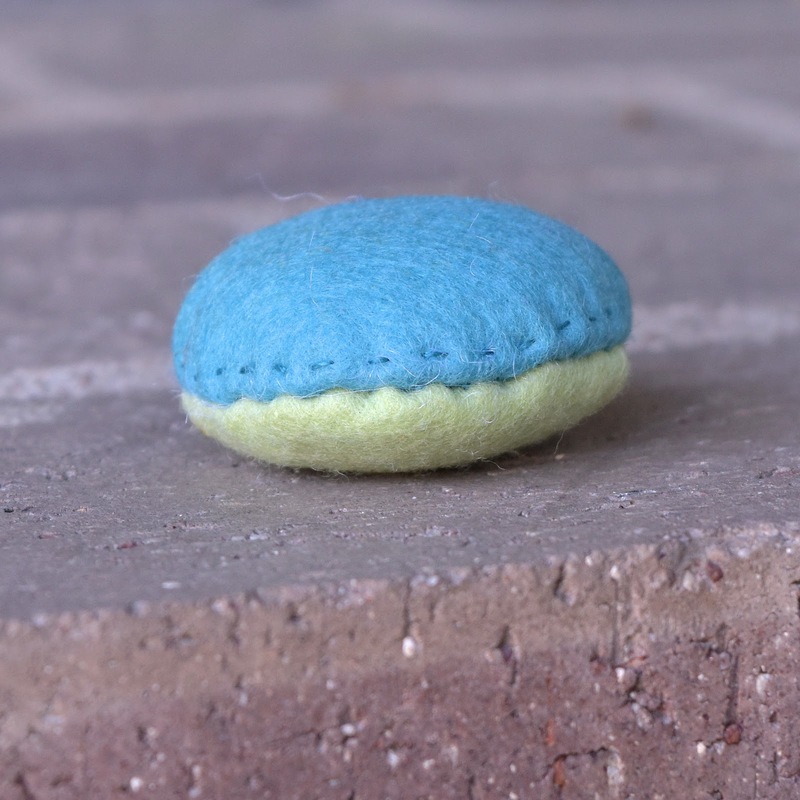 Felt is made by pressing loose fibers together. This can be done in a variety of ways: by machine, by needling and steam, and by water and friction. Additionally, processing methods and dyes have a profound effect on the end product. 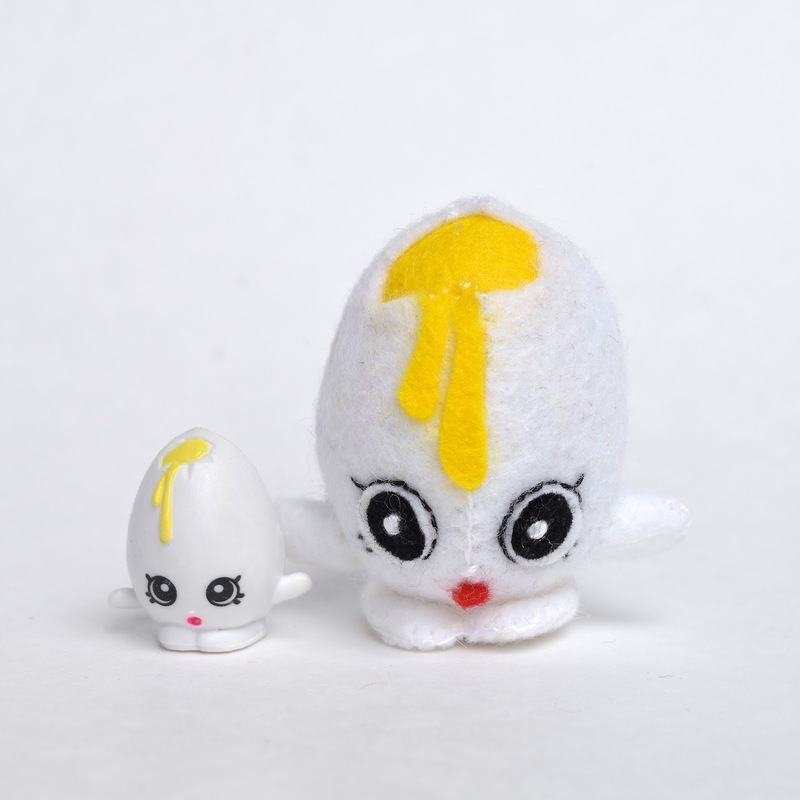 Felt can be made from man-made synthetics e.g. polyester, rayon, rayon/viscose blend, or acrylic (which is marketed as the ubiquitous Acrylic Felt). 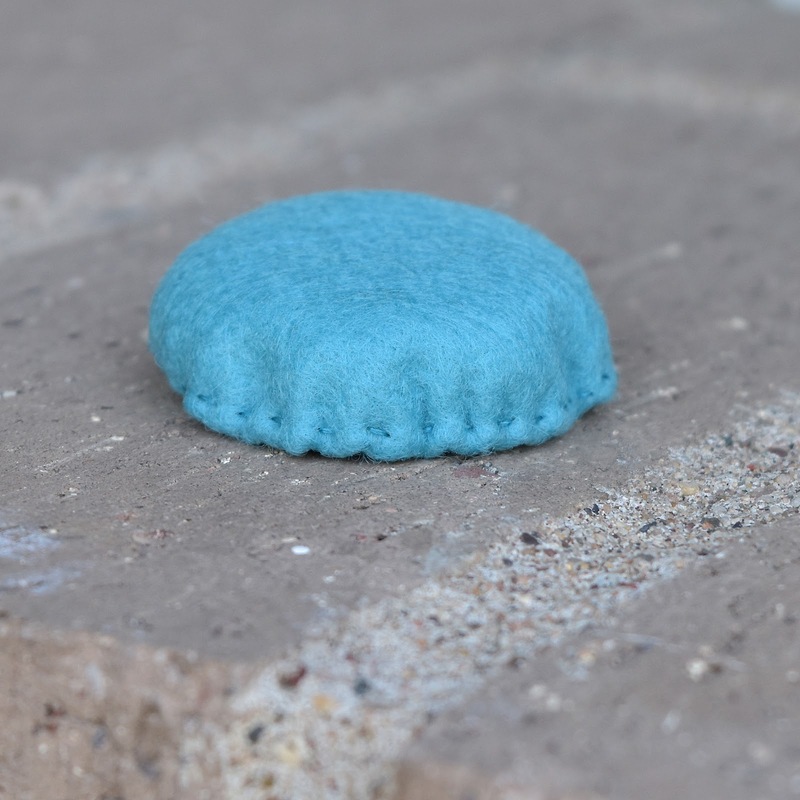 This type of felt is commonly found in craft stores, comes in a variety of colors, and is very inexpensive. They are sold on wide bolts (commonly 72"), as well as in single sheets (usually about 9" x 12"). I've found that in general, the kind on the bolts is of slightly better quality than that of the sheets, although not consistently so; there are times when I've compared a particular color in both and found, for example, that the brown sheets are less pilly (i.e. of better quality) than the brown on-the-bolt felt. 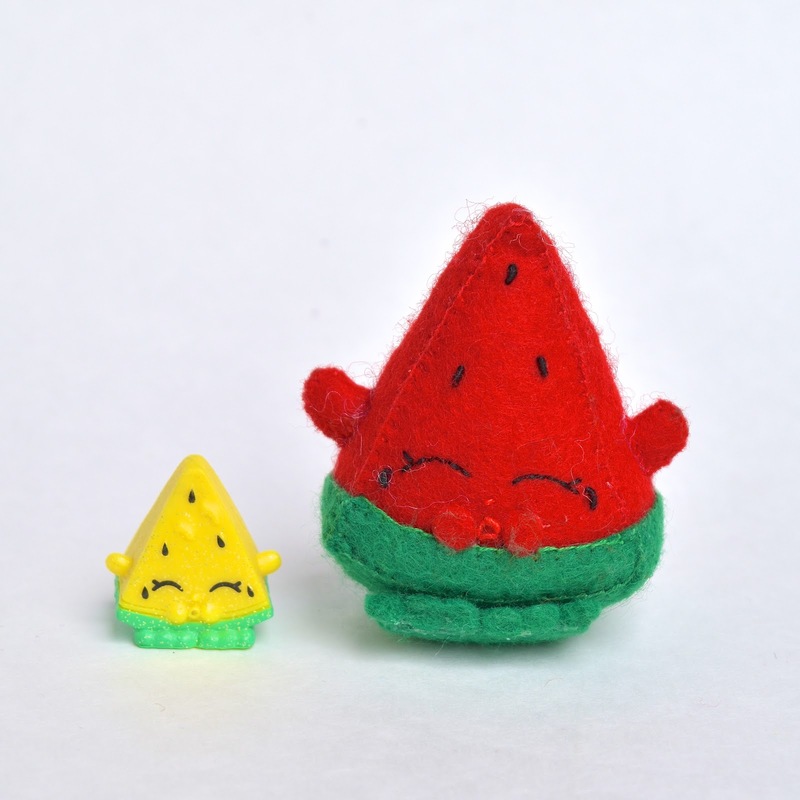 Felt can be made from recycled plastic. This is often called ‘eco-fi’ felt (implying it is environmentally friendly). While it’s true that keeping plastics out of landfills is a terrific idea, the felt itself is not environmentally friendly - not only because of its plastic raw product, but also the process of adding more resources and energy to turn plastic bottles into plastic felt. Perhaps "recycled felt" would be a more accurate term. This felt is also readily found online and is very inexpensive. Made from natural bamboo fibers, bamboo felt is another eco-friendly felt - soft, of reputably good quality, and takes well to dyes. Sold under the brand name Xotic Felt, it is also relatively easy to buy, although it tends to run higher in cost. 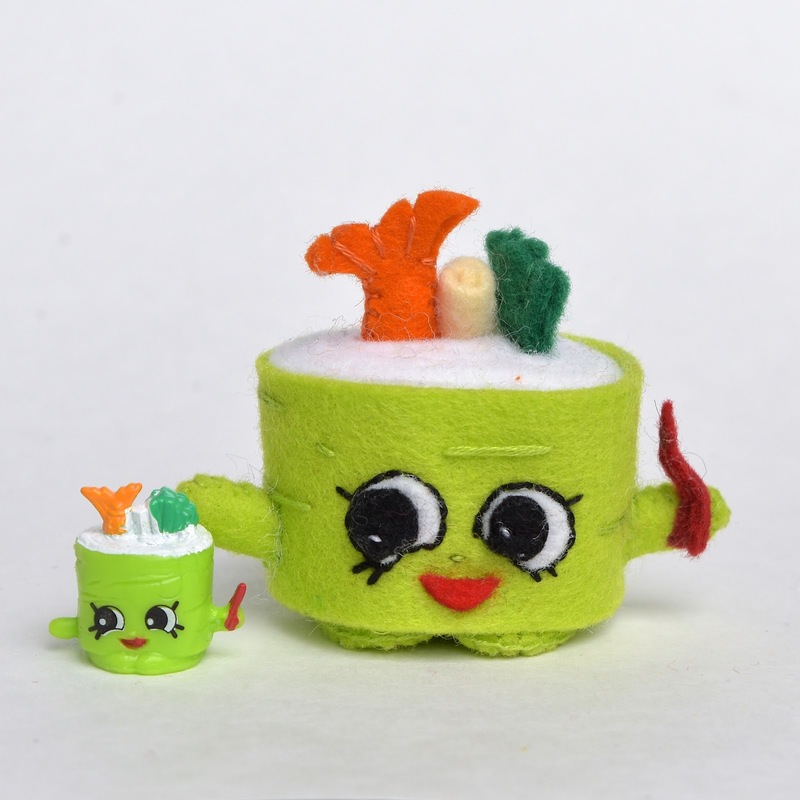 Here is an interesting post on Bamboo felt. These felts contain natural wool; typically having a 10% to 35% wool content, with the remainder being synthetic or man-made fiber, often rayon. Wool-blends are easily found at craft stores and online. Originally produced for commercial purposes decades ago, wool-blend felt has become popular with US crafters who were looking for something more substantial than synthetic. 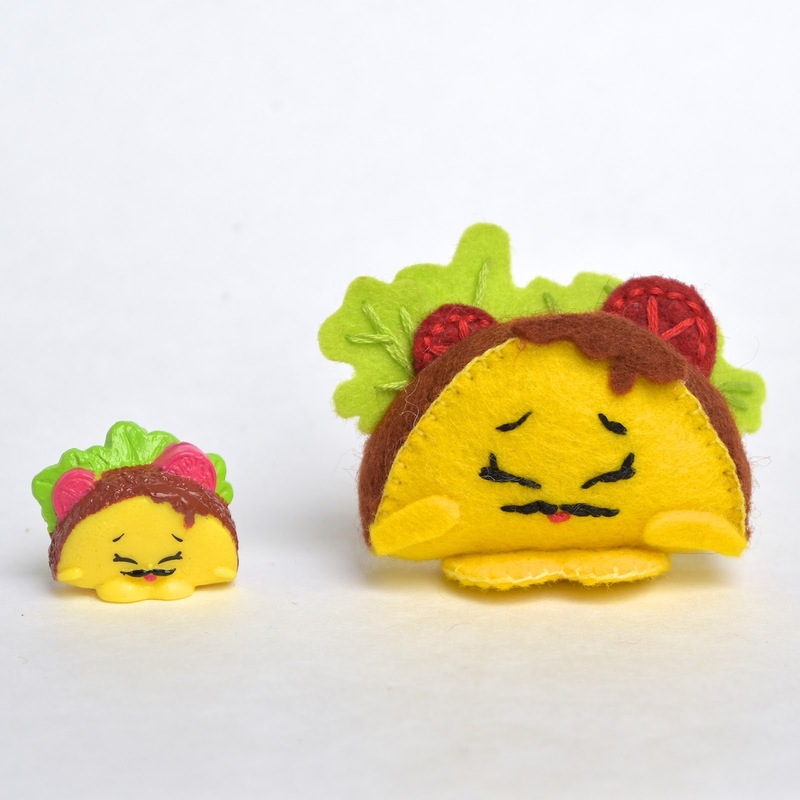 They come in many colors and are quite affordable for the jump in quality over craft felt and plastic felt. This felt is literally all natural wool. It is the only felt that was originally conceived and designed specifically for handwork and sewing. Interestingly enough, not all 100% wool felt is created equal; there are hundreds of different breeds of sheep, each producing a wool fiber with its own unique characteristics. For instance, some sheep are known for producing thick, coarse or stiff fiber. Others produce curly fiber, or long or short fibers. Merino sheep, for instance, produce a soft, fine fiber, and Merino wool felt is a good-quality - and common - wool felt. 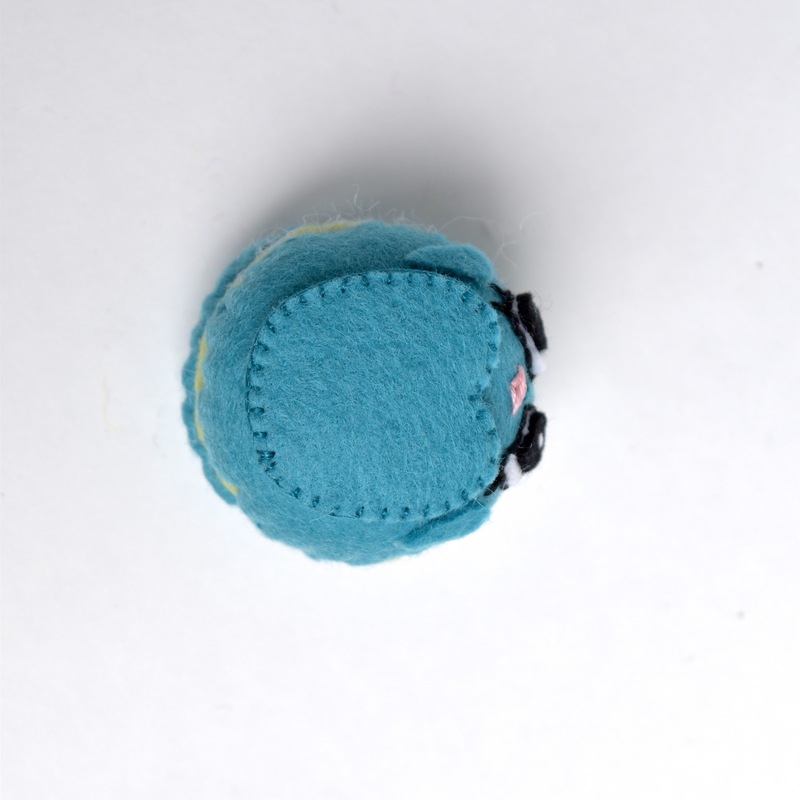 Wool felt comes in different thicknesses, as well as different feels and qualities. 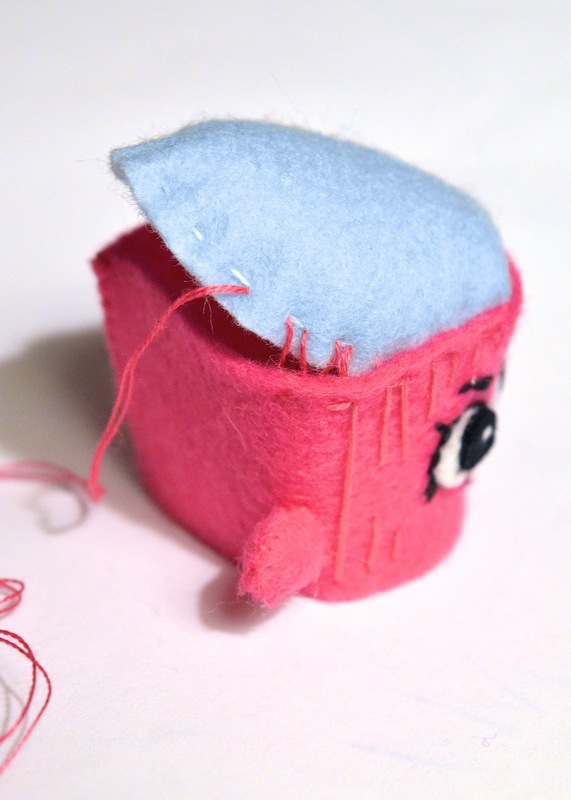 For most hand-stitching projects, 1mm to 3mm is perfect. 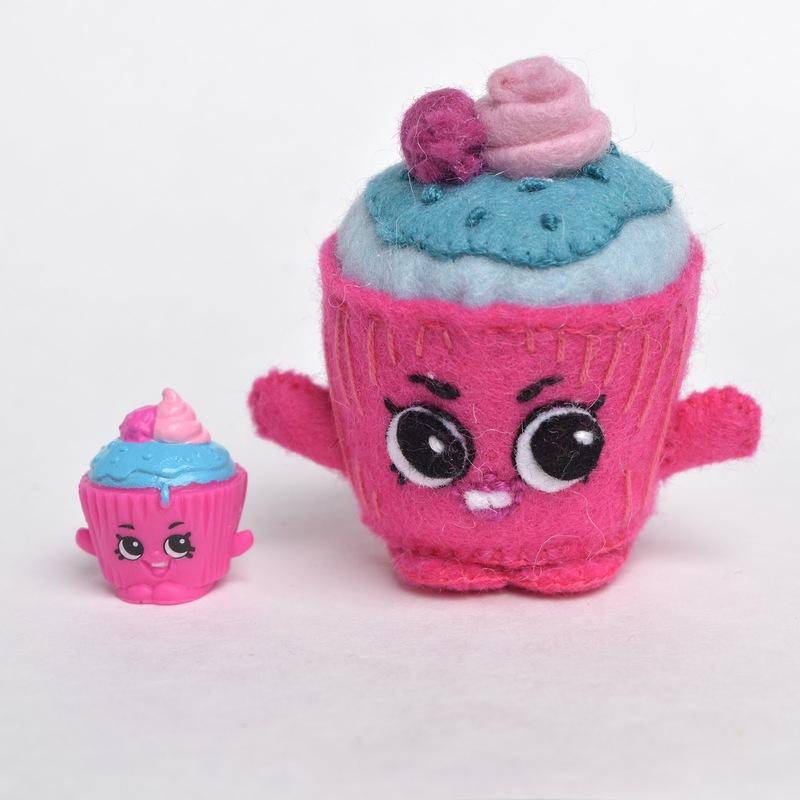 Here is a fun comparison between the four main kinds of felt - craft, eco, wool-blend and wool. I've often been asked which kind of felt I'd recommend for my projects. My short answer is, "the best-quality felt that you can afford." 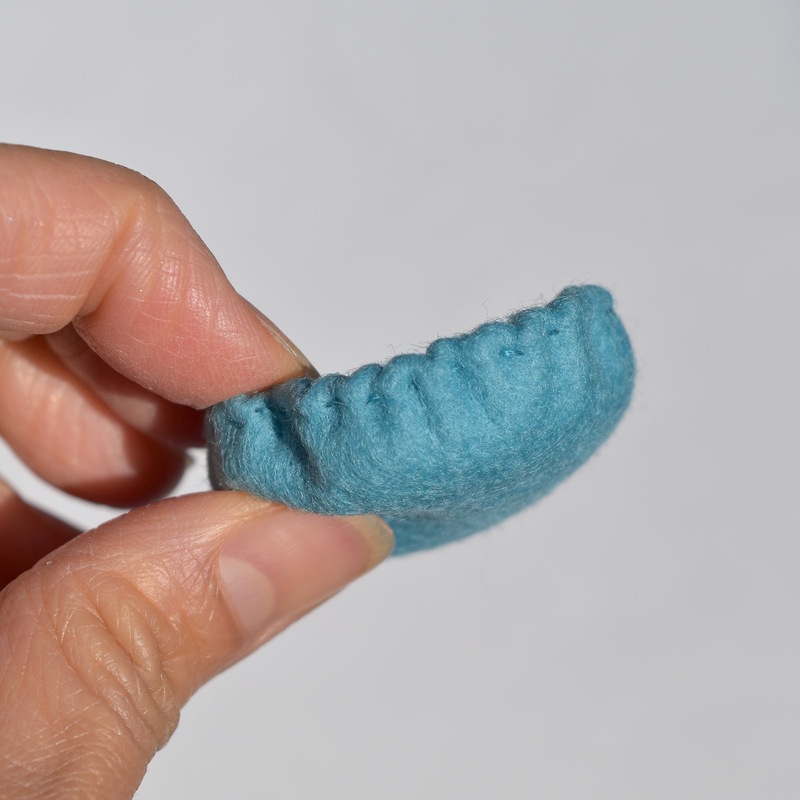 I've found that the higher the natural wool content in the felt, the longer it lasts, the less it pills (the 100% wool felt hardly pills), and the better it holds stitches without tearing. 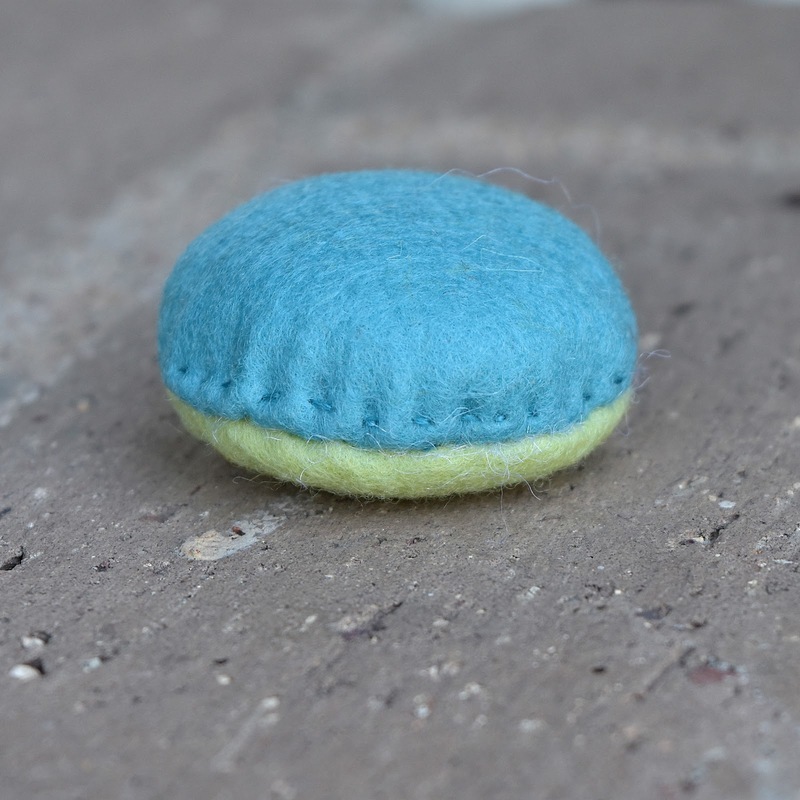 That said, not all of us can afford (or find) 100% wool felt, in which case, here is my long answer, "the most important thing to remember when choosing felt for your project(s) is this: different felts are good for different projects." 100% wool felt, for instance, is best for hand-sewn projects, particularly if they are small, because the fibers hold the stitches well. Craft felt and eco felt are great for large projects that don't require too much detailed stitching - they cost less for more yardage than wool or wool-blend felt. They are also wonderful for projects that only require gluing. Wool-blend felts are good in-between options - they don't pill as much as the synthetic felts, and they are affordable enough to buy in bigger quantities for larger projects. Gorgeous work! You never cease to amaze me! 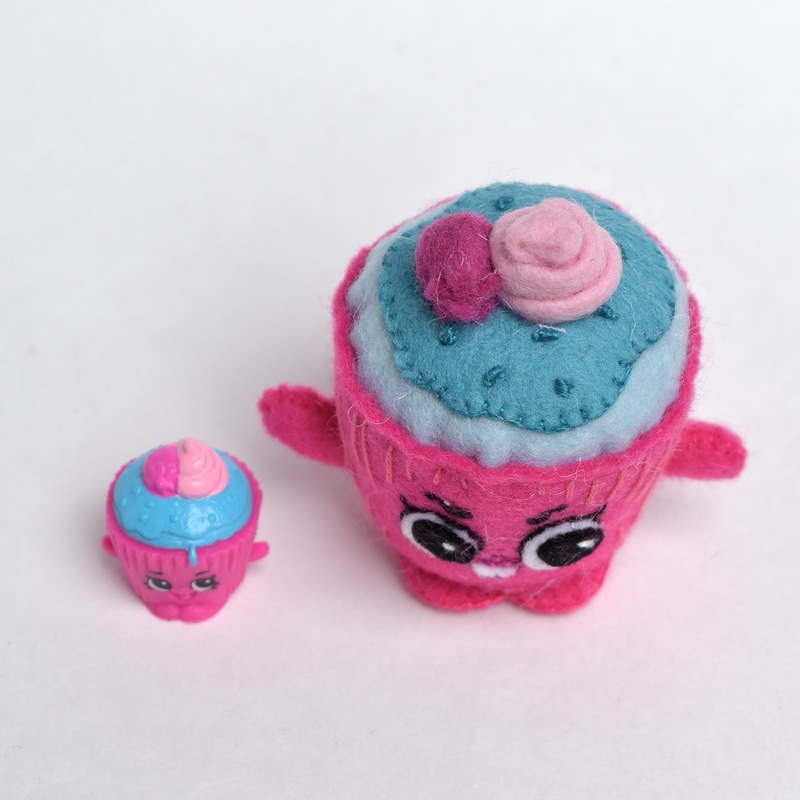 wow, your Shopkins are amazing! my daughter is also a big fan. I will show her your work, and I am sure she will want to try to make some too, not that she can recreate anything to your level...I have had some difficulties with the bowl type shape, so I am really thankful for your technique explanation. 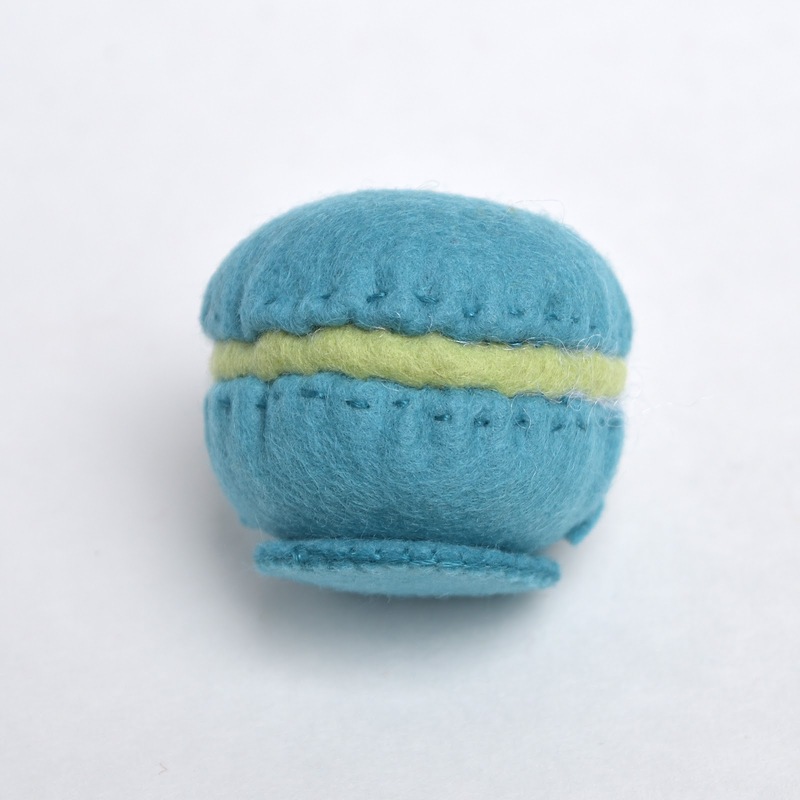 The little macaron seems quite doable now. I still can't believe you made all those tiny creatures(? 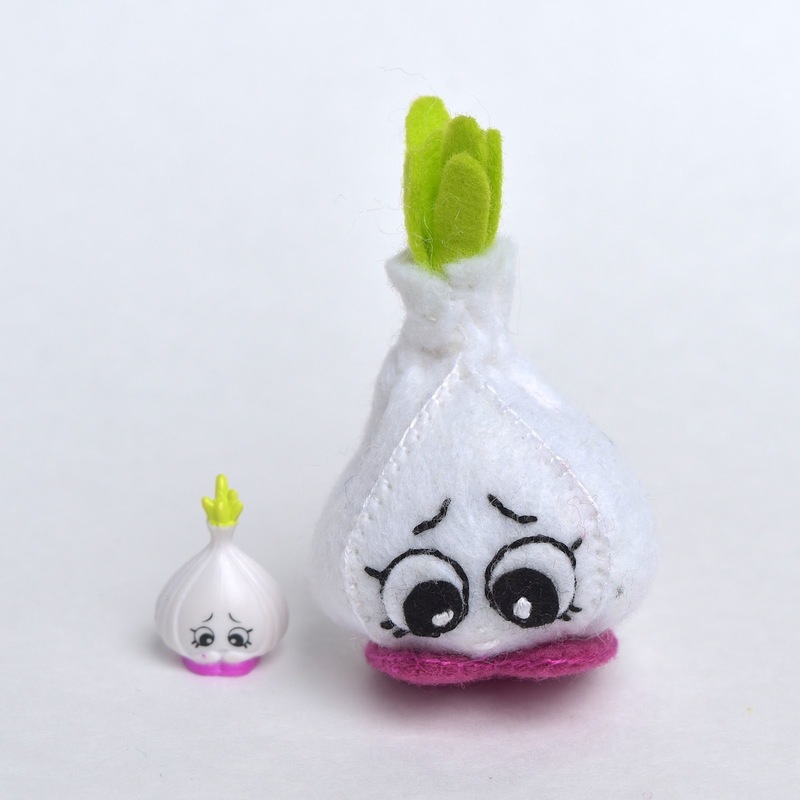 ), especially now that I've seen the real thing and how tiny they are! Only you.... ! :) Thanks for the felt info! I think they look much better in felt (and I have a few of these underfoot). The amount of work, care and attention you put into these tutorials is jaw dropping. And an amazing resource for the rest of us more casual crafters. I am devoted to all things toast, so there's my carry-about hand project for November. As ever, I scrape my jaw up and thank you. Thank you for sharing these felt tips! 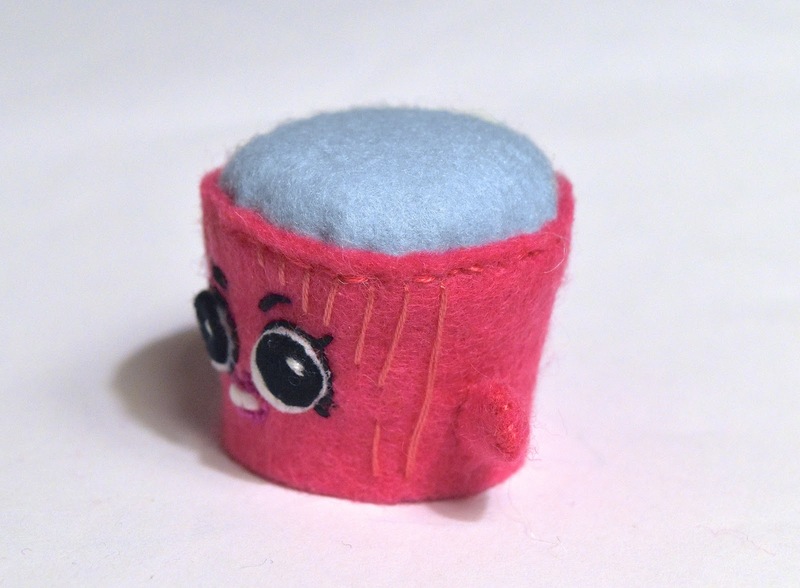 I always get this urge to start sewing felt in November and December, I think because as a kid we would make felt Christmas tree decorations. 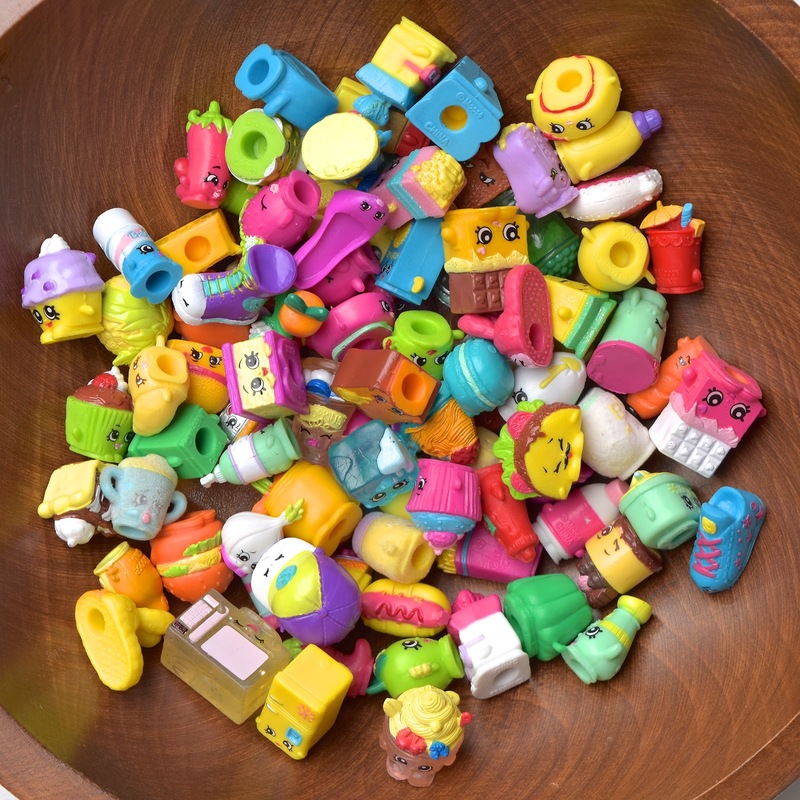 I am kind of grateful that my kids have not gotten into Shopkins. They are cute, but we have so many other cute small things around the house. I love them! You certainly were spot on with replicating them exactly, very well done! Beverly: Unfortunately, no, I don't. Very impressive. 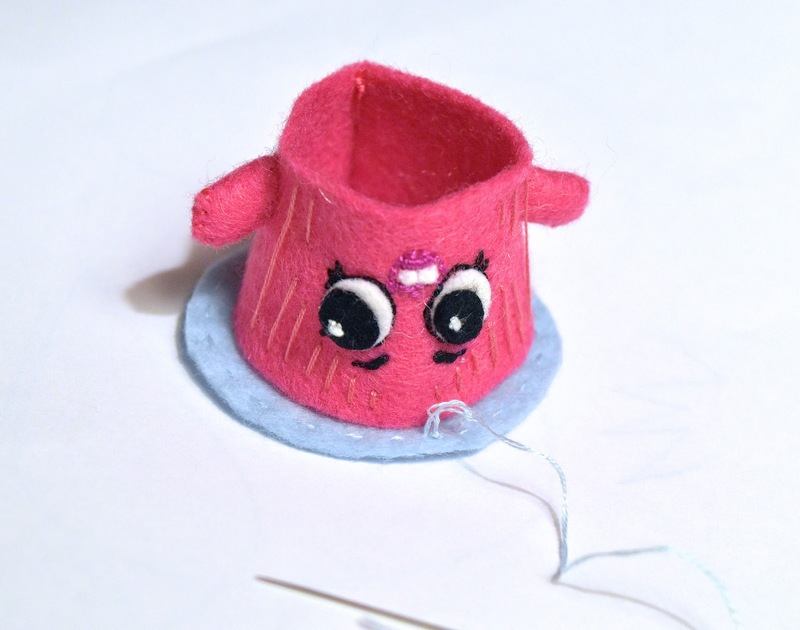 I'm going to try to make one for my niece for Valentines Day.... Thank you for the inspiration!!! !